Ice safety guidelines for a safe winter. Lifesaving Society – Nova Scotia members are asked to give thought to this year’s nominations for the Board of Directors. Please consider who may be appropriate candidates for the available positions and send completed nomination forms to the Nominations Committee Chair on or before 5:00 p.m. on April 15th, 2019. The Society’s Annual General Meeting will take place in Halifax on May 23, 2019. In 2018 we will be transitioning to NEW leadership courses and retiring some existing ones. Check it out in: What's New for Affiliates? Stay tuned for information on our Trainer Update Clinics! Changes in first aid and CPR protocols are made every five years based on a review of the latest scientific research. The most recent recommendations were released on October 15, 2015 by the International Liaison Committee on Resuscitation (ILCOR) in collaboration with the American Heart Association. The Lifesaving Society is collaborating with its national partner agencies to ensure a consistent Canadian interpretation of the new science and best practices applied to resuscitation and first aid protocols. The Society will study the recommendations in detail before determining what changes, if any, may be required in Lifesaving Society training programs and literature. Lifesaving Society instructors, examiners and lifeguards should not change their teaching, evaluation or performance of resuscitation or first aid skills until the Society officially announces changes to its program and literature. Instructors and examiners should continue to follow Lifesaving Society Award Guides for the performance requirements for Lifesaving Society certifications. The Society will advise when any changes are to be introduced. All your lifeguarding needs in one place, clothing, equipment and training materials. 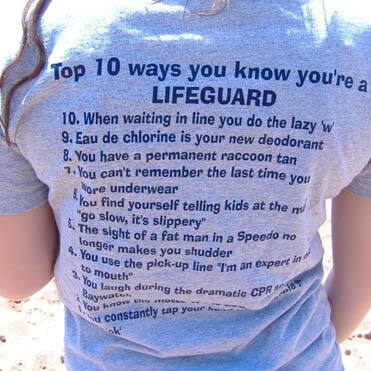 Lifeguards are more than just good swimmers. They are water rescue professionals trained in emergency care. They prevent accidents. They identify hazards and determine safe practices. They educate the public about the hazards and risks associated with aquatic activities and how to be Water Smart®. And they are trained to spot potential trouble and intervene before it becomes life-threatening.